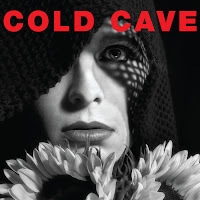 Atlas and the Anchor: Cold Cave - "Cherish The Light Years"
Cold Cave - "Cherish The Light Years"
Cold Cave return with their bolder, more song-oriented new sophomore album Cherish The Light Years, out today on Matador. With more of a focus on the lyrics and singer-songwriter Wesley Eisold’s voice, the album seamlessly incorporates Brit-pop, touches on New Order and The Cure and mixes in harsher textures like, Industrial for a more cohesive and ambitious album. The thundering industrial assault and anthemic chorus of album opener “The Great Pan Is Dead” sets the scene for the darker yet still melodic tone of the album. “Pacing Around The Church” features intertwining guitar and synths with a sound geared more toward the live setting. Stand out track “Confetti” sounds like an MTV-era 80’s hit with swirling, icy synths, thin guitars, moody vocals and a pulsating beat accented by synthesized tom-fills. The bobbing “Catacombs” is upbeat with electronic handclaps while the darker lyrical themes belie the nature of the song. “Underworld USA” is set to a buzzy, insistent beat with syncopated piano notes and another catchy sing-along chorus. The mix of Kraftwerk-like synth patterns and discordant, broken down outbursts makes “Icons Of Summer” another standout. And the grandiose guitar-led “Alchemy And You” features skronky horns and a disorientating rhythm. Closing out the album is the syrupy “Burning Sage” with its smacking beat and the tumbling single “Villians Of The Moon” and its charcoal-tinted gothy melodies. Cherish The Light Years still features the sharp melodies and rough, noisy edges of their acclaimed debut but with a more polished and confident stance that only spells success. Broken Bells - "Meyrin Fields EP"